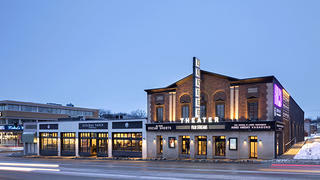 The renovated Dundee Theater, featuring its modern yet historically-inspired marquee. As the world of film changes rapidly, from new technologies to assigned seating at more and more major movie theater chains, historic theaters take on a new imperative in the communities they inhabit. 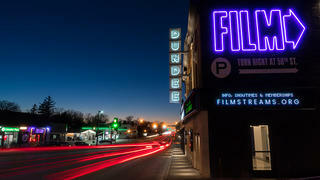 In Omaha’s downtown, the historic Dundee Theater has been restored and taken over by the forward-thinking Film Streams, a nonprofit film organization dedicated to bringing art house films to Omaha as a tool for building communities and fostering connections. In 2007, Film Streams opened the Ruth Sokoloff Theater in northern downtown Omaha. Inspired by that theater's success, Film Streams renovated and reopened the historic Dundee Theater in December 2017. According to Executive Director Rachel Jacobson, business is good—better than they had dared to hope. Oscar-season buzz brought an invigorated audience to the Dundee, which was met with openings of board member Alexander Payne’s Downsizing and Paul Thomas Anderson’s Phantom Thread. In the three months since the Dundee Theater reopened, Film Streams has seen a more than 60 percent increase in membership. As an arts nonprofit, this type of growth is staggering, and is a marker of just some of what historic theaters have to offer a modern public. The 92-year-old Dundee Theater originally opened in 1925 as a vaudeville house, and holds a unique place both in Omaha and film history. A recent showing of Agnès Varda and JR's film, "Faces Places." It occupies a prominent space along Dodge Street in Omaha’s Dundee neighborhood, and has operated as a theater for most of the 20th century. After decades of re-branding and changes in ownership, the theater closed in 2013. When the Dundee was threatened with demolition, Film Streams, which had been looking to expand, knew that they had both the capacity and the vision to save the theater and bring it back to what it once was. That dream became a reality after the Omaha-based Sherwood Foundation purchased the theater and the property immediately adjacent, and donated it to Film Streams. 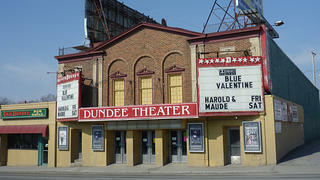 The Dundee Theater just before its closing in 2013. The renovation took place over the better part of 2017, and was led by Alley Poyner Macchietto Architecture, which advocated for not just the preservation and restoration of historic building materials, but for creating a modern theater with modern amenities. Blending the best of the old with the new, the Dodge Street facade is now punctuated by a massive vertical marquee spelling out DUNDEE, based on a late 1930s marquee found in historic photographs. It’s so bright that it required both city and state approval due to its potential impact on Dodge Street, a major thoroughfare. However, it’s more than just a flashy sign and a stroke of marketing genius. The theater is a place-making statement for the Dundee neighborhood, which has lost the majority of its historic buildings along Dodge Street, despite being part of the National Register-listed Dundee/Happy Hollows Historic District. The Dodge Street elevation recalls an earlier era of cinema, with some clearly modern additions. Inside, many historic elements of the theater were restored, including the historic molding and the terrazzo tile in the main lobby. Windows that had been bricked up in what is now the lobby and events space were opened, letting more light into these spaces. The sloped floor in the theater remains, retaining the feel the Dundee has held for generations of families. Efforts were made to ensure the modern additions wouldn’t overpower the community’s memories of the theater as it once was. The main theater now includes 300 cushy blue fabric seats, which are nearly identical to the seats used from the mid-1960s to 2013. The seats were installed for a 188-week run of The Sound of Music—which was then the second-longest first run of a film ever, anywhere. A few of these benches were saved for posterity. And Film Streams added a new state-of-the-art Boston Light & Sound DCP projection and sound system. But that doesn’t mean that Film Streams has abandoned traditional 35mm film: The nonprofit has made it their mission to continue to play 35mm films for their historic and archival values, making seeing historic films as their creators intended possible. Film Streams also expanded the Dundee Theater beyond the single screen. 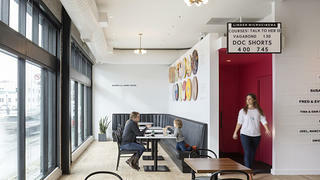 In an effort to create a space not just to see films but for the Omaha film community to interact, they added onto the space, bringing a new local restaurant named Kitchen Table and a micro-cinema suited to more experimental film screenings. The micro-cinema was outfitted with historic film media in mind, including equipment to play 16mm films, which made a recent loan of rare Andy Warhol films from the Museum of Modern Art accessible to a new audience. 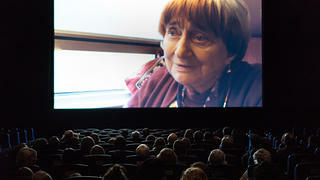 The micro-cinema has doubled Film Streams' programmatic opportunities, and has recently made possible showings on its smaller screen and the large screen of Ex Libris, a sampling of Korean and Norwegian films, and a review of the oeuvre of Agnès Varda, including her recent Faces Places. Local artwork decorates this bit of restaurant seating, which leads to the micro-cinema. 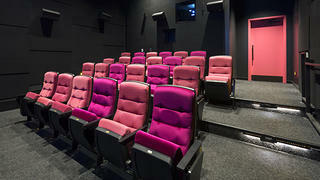 The cozy interior of the micro-cinema, which shows more experimental films. While crowds who packed the Dundee Theater for midnight showings of The Room now flock to showings of The Disaster Artist, Dundee Theater has only increased its impact on the local Omaha community since its highly anticipated re-opening. Putting their goals into tangible action, Film Streams has brought more than 5,000 high school kids to their theaters to engage in these types of discussions. Using Ava DuVernay’s 13th, a film exploring racial inequality and imprisonment in the United States, as a jumping-off point, hundreds of kids and young adults are engaging in challenging conversations in this historic space. In this space, at the intersections of community-building, art, and film, Film Streams has done much more than renovate Dundee Theater: They have brought it a new life. Mikayla Raymond is a proud preservationist and editorial intern at the National Trust. She lives for public parks, weird art, and women’s history.